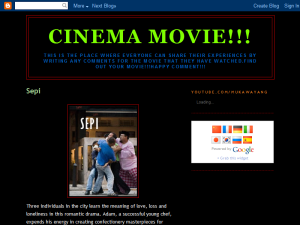 This is the place where everyone can share their experiences by writing any comments for the movie that they have watched.Find out your movie!! !Happy Comment! This what your Cinema!Cinema!Cinema! Blog Ad will look like to visitors! Of course you will want to use keywords and ad targeting to get the most out of your ad campaign! So purchase an ad space today before there all gone! Made of Honour is a romantic comedy movie about maid of honor. Starring Patrick Demsey as a guy who falls in love with a girl. But he ends up being her maid of honor. He agreed because he wants to win her heart. If you are the owner of Cinema!Cinema!Cinema!, or someone who enjoys this blog why not upgrade it to a Featured Listing or Permanent Listing?